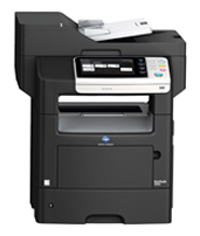 BIZHUB 3320 The Konica Minolta bizhub 3320 packs higher productivity in smaller dimensions – up to 35 ppm print/copy output in high-resolution B&W, fast scanning to multiple destinations, simple touchscreen control and lower cost per page than conventional laser printers. Both models are ready for network integration, with built-in fax capability and support for PageScope and mobile printing functions – and their highquality,low-cost operation makes them ideal for branch offices, small businesses, nurses' stations, schools, law providers and retail locations. MURATEC F315The F-315 combines an 80-sheet automatic document feeder, 200 location auto dialing, convenient broadcasting and group dialing, automatic transmission confirmation report printing, secure reception and PIN masking to create the perfect workgroup fax solution. 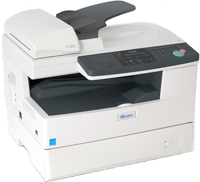 The F-315 can even be fitted with a dual line to enable simultaneous fax sending & receiving, and can integrate with a network fax server to offer users a convenient, transparent method of sending hardcopy documents through the fax server.